Today I am home sick with a nasty cold. I haven’t had a cold like this in years – I can barely breathe and food has no taste! And the worst part, I can’t take any medications outside of Tylenol. During pregnancy, the woman’s immune system is suppressed so that it won’t fight off the baby growing inside you. This means that my normally strong immune system didn’t stand a chance when my co-worker came into work sick last week. I haven’t had an illness that has knocked me down like this since I started to run – since Wednesday, I’ve only worked out one time! It’s very unlike me, but I’m trying to listen to my body and do what’s best for the baby growing inside me. And for now, that means lots of rest. The good news about staying home sick today was that it’s Marathon Monday! 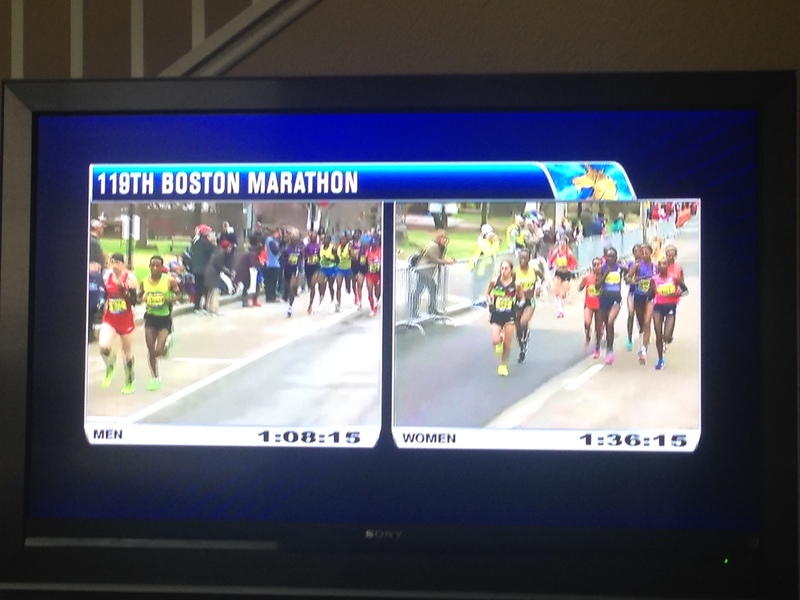 Normally I follow the Boston Marathon via twitter/Facebook and am not able to stream it from my work computer but this morning I got to watch on our TV while simultaneously tracking my non-elite (yet seriously fast) friends running the race via the online athlete tracker. Despite pretty non-ideal conditions, everyone is racing their hearts out. Of course, Boston race day always brings up some emotions for me. The last two years the emotions are both related to mourning over the bombings and regret for my own failed attempts at qualifying. This year is the 2nd year that I thought I might be able to race and next year will be the 3rd Boston in a row that I had imagined myself crossing that finish line on Boylston Street. I’ve only been able to make one Boston qualifying attempt per year due to various reasons and each time I’ve come out disappointed but with pride and more knowledge about myself as a runner. And of course, this year there will be no attempt. 2015 will be the year of the baby. I’m not sure what 2016 will bring but I do hope to run another marathon. There’s no way for me to know how my body will react to pregnancy and child birth and I have no idea how long it’ll take me to recover and get back into the same shape (or better) that I was in for CIM. Or, maybe motherhood will change my perspective all together. So while I’m hopeful that 2016 will be a marathon year, I really have no way of knowing. There’s really a lot of unknowns right now for me, which at times can be uncomfortable because I find so much joy in planning things out. I’ve already started to wonder how my workout routine will even fit in with balancing working full time, childcare drop off and pick-ups, breast feeding/pumping and taking care of an infant (and the lack of sleep…). Luckily I have a very supportive husband who I’m confident will be bearing a lot of the workload along with me, but it’s going to be a big change no matter what. Fitness is a priority to me, and I know it always will be, but I also know my child will be the highest of all priorities. The thought of 4:30 AM treadmill runs to get in training seems daunting at this point. But, like I said, those 4:30 AM treadmill runs might not be necessary – I just can’t plan it now! The fire inside me to qualify for Boston is not gone. I’ll definitely be in Boston one day, it’s just going to take more time to get there than I originally anticipated. 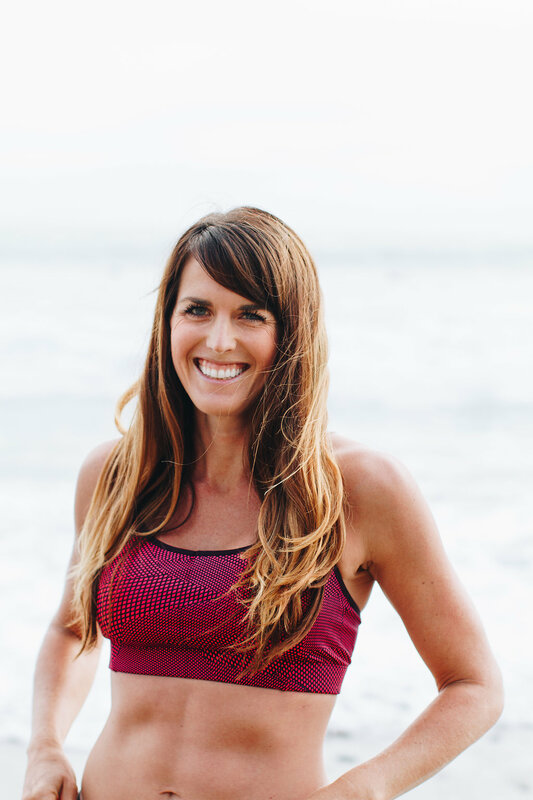 Through this blog and my involvement with Oiselle, I’ve met so many incredibly inspiring (and wicked fast) mothers who prove that you can be a great parent AND a great runner. It might take some creativity and yes, some early mornings, but it is possible. Congrats to all of you Boston Marathon finishers today! You inspire me. Love it!! I didn’t start running at all until I was a mom and didn’t qualify for boston until after baby #2. I have no doubt that if/when you feel ready to focus back in on running you will achieve great things. Being a mom makes you strong! The hardest thing for me while pregnant was trying to plan the future. I, like you, am a planner. I even created a Google spreadsheet for my husband and me to try to balance meal/sleep times (that attempt failed miserably). My advice there is to take it one day at a time, which it sounds like you are doing. Fitness is rewarding but motherhood is more so, and fitness will always be a part of your life. Give yourself a lot of time and patience that first year to find the balance, which always seems to inevitably happen that first year of your child’s life. Best to you. Aw- hope you feel better soon. The silver lining is definitely that you got to stay home and watch the marathon! Yup- a baby definitely changes everything. I can see why people who weren’t into fitness before motherhood don’t get into it. It’s tough to balance, at least at the beginning when they aren’t sleeping well and aren’t scheduled. However, you love running and fitness so I have no doubt you’ll be out there. For me personally, it’s also changed my goals. For now I can’t see myself wanting to kill myself out there for a race. It’s all about the fitness and love of running right now. But that fire might come back once I’m in better shape! Yeah I Really have no idea – maybe Boston won’t even be a concern to me come September!! I can completely relate to the feelings of not knowing what to expect after giving birth. I’m a planner too and like to look ahead and have something on the agenda to look forward to. Life up to this point has been fairly predictable when it comes to running and fitness. It seems like everyone has a different experience – some women bounce back quickly and others don’t. I like to have this vision that after 6-8 weeks post-natal I will be ready to rock n’ roll and will come back stronger than ever (which I hear a lot of women do), but who knows what will happen. Who knows if my mind, body, energy levels will want that very same thing. And then everyone keeps asking if I am going to have another baby after this one… so much to think about!! I hope you are feeling better!! No fun being sick!! I didn’t get to watch any of the coverage. I was pretty sad not to know anything until the evening. I can’t believe the weather. Never give up! I ran my 1st Boston this year, and it is everything you have ever dreamed of, and more! (desire the crappy weather) I most have cried from happiness like 50 times last weekend…You will get there, and it will be awesome! And you family will be there to cheer you on! I do 4am runs (bc of my work hours), if need be, you do actually get used to it…. Congrats on your pregnancy, and go after Boston (when the time is right) There is no race like it… feel better!